﻿﻿"So," begins the rather benign comment from a close friend. "You got your Christmas shopping done yet?" My mind fills with turmoil not unlike a class 4 hurricane. Holy cow, is it that time of year again? Yeah sure, I know. It's now post-Thanksgiving, so I should probably consider giving things a kick start. But the crowds, the mall, the challenge of finding the perfect gift for those I love. I'm just not feeling it yet. I eye early shoppers with the same wariness that I give morning people (where do they come from?). I know y'all are out there rarin' to go and all, but please . . . just give me a minute. I'll catch up with you in just a bit and then we can all share in the glory of the day. In the meantime, however, I'm at peace in my little world of denial. It's a happy place we call Donna Land. Everybody knows me there and they're all really nice. The dark roast coffee's always freshly brewed there. And Krispy Kreme's are only one weight watcher point value . . sigh. Right, on to thinking about holiday shopping. I had an opportunity to get started on this during a recent CCI event at Barnes & Noble. Fellow puppy raisers Esther and Bud organize a free gift wrapping service at B&N every Christmas season. We were there this past Saturday, just after Thanksgiving. 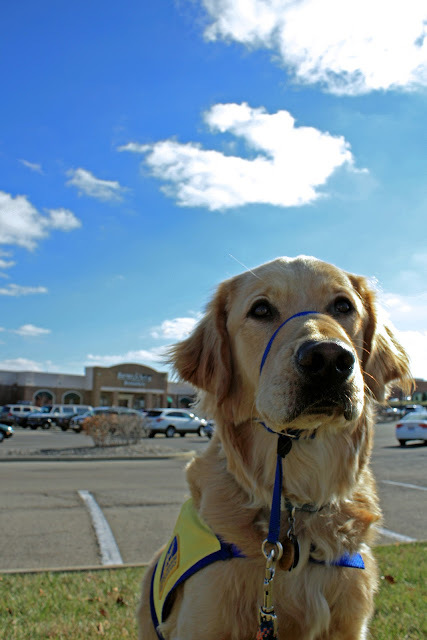 Micron and I took an early afternoon shift to help raise awareness of Canine Companions for Independence. ﻿﻿﻿﻿Micron just loves the kids. Little boys smell like french fries and the girls like cotton candy. He's a friendly, calm dog that children find very approachable. If only I could just encourage him to keep his tongue to himself. More than one hapless tyke has received a wet willy from this dog. Remember the Wizard of Oz and the cowardly lion's tail? How it was always moving around like it had a mind of its own? Well, that's Micron's tongue. Random mother: "Oh, it's ok if he licks my kid." Me: (inside thoughts: NO IT'S NOT!) "We really don't want the pups to lick people. It's not becoming of a service dog. Part of his training and all, you know." Random mother: (inside thoughts: WHAT A MEANIE!) "Oh. Ok."
Ugh, just kidding of course. About the rubberband thing. Not the goal. We'll reach our goal, we will. Julie waiting to work her new fan base. Julie and Micron taking a wee break. You're not alone. Ansel also has the uncontrollable desire to give everyone a tongue bath. 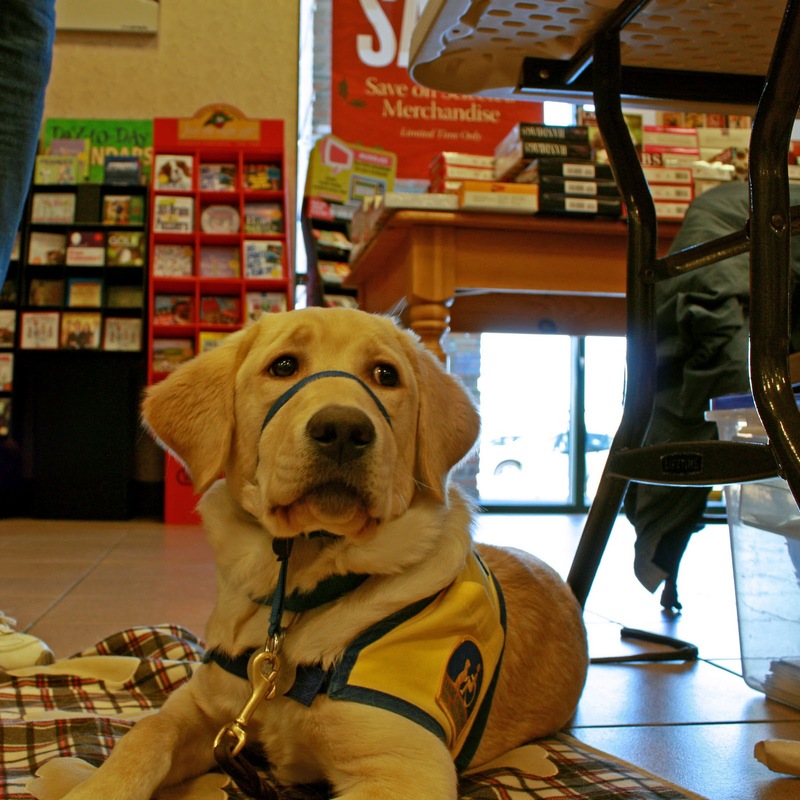 I did B&N with Dembre at Easton last Saturday for the morning shift. The manager kept on trying to get Dembre to lick her even after he was corrected a million times. Then she asked "Is he allowed to lick?" our answer "NO!" "Oh" and then she continues sticking her hand out for him to lick :P. My Mom and I were running the table and only wrapped 10 or so gifts over the course of FOUR hours. We never got our package of brochures to take so we took the ones we already had at home! It all worked out fine and was pretty fun.